Mega Sale! 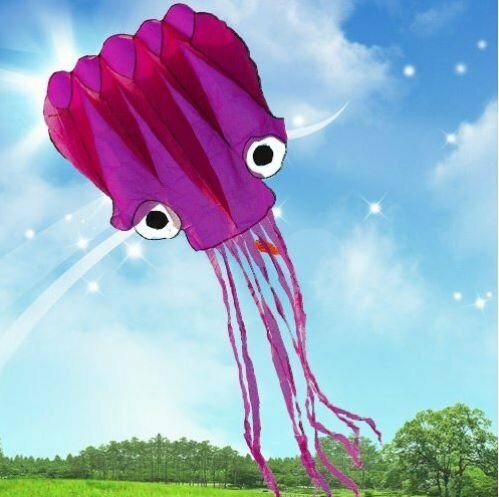 Save 28% on the 5M Large Octopus Parafoil Kite with Handle & String by Amazona's presentz by Amazona's presentz at Scruffs Game. MPN: 43294-1001. Hurry! Limited time offer. Offer valid only while supplies last. ''Amazona's presentz'' 5M large 3D parafoil octopus kite will look stunning in the sky at any time of the year, it will delight flyers of all ages. "Amazona's presentz" 5M large 3D parafoil octopus kite will look stunning in the sky at any time of the year, it will delight flyers of all ages. With its bright and vibrant colours. it is a colourful wonder in the sky and let it looks like Alien in the sky. Fun & easy to Fly , even in light breeze ( Wind Range: >12 mph), can also be an great gift idea for your friends. Please indentify the genuine , original octopus kite you received come with a "Amazona's Presentz" kite bag. - Kite flying will regenerate energy and has a way of reducing stress and tension of everyday life. - Kite flying develops creative thinking, both in the making of the kite as well as flying and adapting it. - Another less known benefit of kite flying is the development of concentration. - Kite flying is one of the only recreational activities that is both low budget as well as safe and environmentally friendly. - Kite-flying is also good for eye health. People must look at the blue sky flying kites, kite line of sight distance with the level of the move, better regulation of the regulating eye muscles and nerves, which help alleviate eye fatigue, prevent myopia, your eyes. GREAT GIFT IDEAS for your friends. Package included: original kite bag, handle & string, ready to fly! If you have any questions about this product by Amazona's presentz, contact us by completing and submitting the form below. If you are looking for a specif part number, please include it with your message.